In April 1925, Scotland hosted England at Hampden Park. England’s captain that day was a proud Lancastrian, Sam Wadsworth. It was the pinnacle of an extraordinary career. Lamentably, very few people have heard of Sam. Thankfully, illustrating prodigious foresight for the time, Wadsworth left behind hours of personal tape recordings. These captivating audible accounts voice an incredible life story, and are as poignant as they are inspirational. Born in Darwen, Lancashire in 1896, Sam was obsessed by football from an early age. Infatuated, he played for hours in his back yard with an old tennis ball. His father, James, himself a keen rugby player, helped his son improve his skills, by making him train with a football boot on his left foot and a slipper on his right. Sam had a close bond with his father and on Saturdays they would go down to Ewood Park and watch their beloved Blackburn Rovers. As a youngster, he played for Darwen Woodfold in the Blackburn and District League, before graduating to the town team. It was a boys dream. I was the first there. I was the first to get changed. His introduction, against Manchester City, went like a dream. Wadsworth scored and created another in a 4-1 win. “It was a very happy ending,” he modestly observed. Still just 17, Sam enjoyed working as a Clerk and treasured playing for the reserves – often watched by crowds of five and six thousand. Life was wonderful, but soon – and despairingly – “The dark clouds came”. The First World War broke out and Wadsworth’s older brother, Charles, immediately enlisted. Sam idolised Charles and even lied about his age just so he could quickly join his brother in France. “It was my duty,” he said simplistically. Wadsworth served with the Royal Garrison Artillery and spent four years of life and death in the muddy trenches of France and Belgium. Charles was tragically killed in 1918. I came home, but Charlie didn’t. He lies in Belgium. I had lost my only brother and my best friend and supporter. Sam himself was wounded by shrapnel in his left ankle, but it was the mental scares that caused him the greatest impairment. Once War ended, Wadsworth returned home shell-shocked and haunted by the horrors he’d witnessed. Alongside grieving for his brother, he also suffered from blackouts and severe post-traumatic stress. There were several painful months of recovery. It had been all I had lived for over four years. My heart was broken. My life’s dream had gone with the wind. I was very bitter. It was not very nice treatment. His father even had to stop him from throwing his only pair of boots on the fire. Determined that his son’s talents and love of the game wouldn’t go to waste, James managed to arrange a trial with non-League Nelson. Wadsworth shone and quickly became a star in the side. Sam also met and married his wife. It was a blissful time. After a couple of years, another top team took notice and in April 1921, Sam joined First Division Huddersfield Town. He made his first-class professional debut against Chelsea, but not without an amusing misunderstanding. The gate steward didn’t recognise the new signing and obstinately refused to let him into the ground. With characteristic patience, Sam finally convinced him he was in fact the clubs new left-back and not just some chancer trying it on. Shortly after, Huddersfield appointed the soon-to-be legendary Manager, Herbert Chapman, and Sam became a regular in one of the greatest club sides in history. Town won the FA Cup in 1922, Sam’s first full season, and along the way, Wadsworth got revenge on Blackburn Rovers for discarding him. Sam even thought he’d scored a late winner against them, only for the referee to judge the ball hadn’t crossed the line. Huddersfield made no mistake in the replay and hammered Rovers 5-0. “They should’ve given you your goal, Sam,” Rovers centre-forward Percy Dawson moaned. “It would’ve saved us this hiding”. Fine form rapidly gained him England recognition. 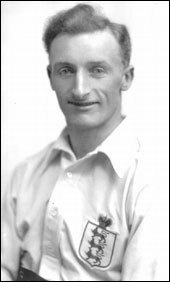 In an era when international football matches were rare, he would go on to make nine appearances for England between April 1922 and October 1926, and was captain for his final four appearances. I still continued to wear the same size of hat. In the seasons that followed, Huddersfield won an amazing three successive First Division Championships, in 1924/25/26, and were also League runners-up in 1927 and 1928. 1928 also saw Town reach another FA Cup final, where again they faced Blackburn Rovers. Agonisingly, a knee injury meant Wadsworth missed the final. He reported fit, but the doctor refused to risk him. Helpless, Sam could only watch on in anguish, as Rovers won the FA Cup final and Arsenal pipped them to another League title. That same knee injury ended Sam’s playing days (although, he did play a few games for Burnley – Blackburn’s fierce rivals- in 1929). All throughout our great period Sam was, in my opinion, the greatest left back playing football. Gloomily, retirement came and hard times loomed once more. Sam and his wife lost all their money in a failed garage venture. He was struggling to make ends meet and desperately missing his playing days, when a friend at the FA informed him that Delft club in Holland were looking for an English manager. Sam applied and… to his surprise… got the job. They moved to Holland in 1934 and Wadsworth quickly established himself as an up-and-coming coach. He impressed PSV Eindhoven and they appointed him Manager the following year. Sam was highly regarded by the Dutch giants and had two spells as manager- 1935-1938 and 1945-1951. His secondterm was his most successful, as PSV won the Dutch Cup in 1949-50 and then the Dutch League Championship in 1950-51. Both during and after his spells with PSV, Wadsworth was employed as Technical Director of the Dutch Football Association. Wadsworth had several attributes, among them a masterly sense of positional play. He was a wonderful kicker of judgement, which made him supreme in the art of setting his own attack going from defensive positions. Never think you are the best. Always be ready to learn; always listen to good advice. I never think I know it all. I’m well into my 50s now but I can still learn…. and I enjoy it. Please try to be sportsmen. Always play fair; be always ready to congratulate your conqueror and you’ll never be sorry for it. I’ve always played fair and tried to play fair. Even today, many years since I left the field of play, I am still welcome in all circles. Why? Because I played fair. You do the same. You’ll never regret it. Sam Wadsworth courageously overcame the horrors of the Great War, illness, rejection and tragedy to become Captain of England and a successful football manager. He remained a modest gentleman and forever embraced the merits of duty, comradeship and fair play. Sam Wadsworth’s personal tapes are available from the North West Sound Archive. Email: nwsa@ed.lancscc.gov.uk.